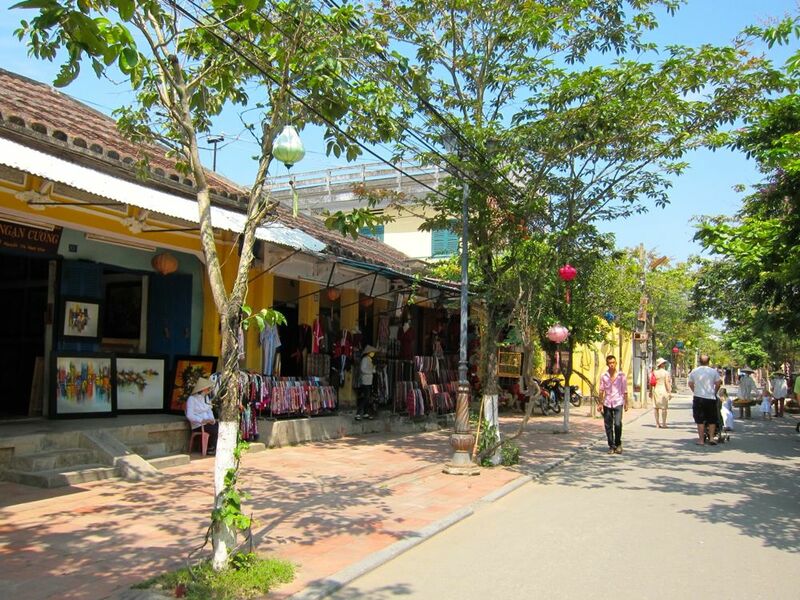 An ancient trading port in the South China Sea, Hoi An is a city full of history, charm and interesting things to do. Walk through its streets and feel what it must have been like when it was a busy port. For years, I have wanted to visit the heritage city of Hoi An and the desire grew as we heard the stories of friends who dropped into Hoi An each time they visited us in Cambodia. When part of our own family came to visit, I saw this as a great opportunity to go to a really historic region while at the same time enjoying the beaches and the ocean. Declared a UNESCO Heritage Site in 1999 but hidden by the popularity of Hue and Da Nang, Hoi An used to occupy a very important role in the powerful Champa Empire. The Cham people had chosen this as a commercial capital and the Chinese and Japanese merchants set up camp in their trading houses wholesaling products that the Cham could then move inland to the Mekong river valley. Most of the old city has been preserved showing the homes, temples and trading houses of the Chinese and Cham traders who lived there as well as the richness in the Cham culture that dominated many parts of Southeast Asia during its pre-European colonial heyday. In short, there is a lot more to Viet Nam than just the memories of defeated Empires...although if self disgust is important, Hoi An is very close to Mai Lai. Hoi An offers many things to enjoy in a user friendly environment. The first thing we did was walk through the maze of the city and enjoy the vintage squatty houses lining the closed off streets. Most of the day there is no vehicle traffic so even Newbies to Asia are safe. There is a wonderful guide you can pick up with your ticket at the 4 Old Town booths: 30 Tran Phu, 5 Hoang Dieu, 78 Le Loi, and 10 Nguyen Hue. This map guides you to the places worth visiting. The walk is amazing as you begin to see that Hoi An combines a total dedication to separating you from your money, offering incredible custom made merchandise, with a real engagement with local culture. And the food! Terrific variety, amazing tastes and great prices. The town is clean, it is engaging and it is really fun. ​Images simply stick to your mind: old women clad in their traditional trousers and practical Vietnamese hats with their wares straddled on their shoulders and faces that beg to be photographed (ask first!). Temples and assembly halls, usually Chinese, one for each family of traders like the Cantonese, the Fujian, or the Chaozhu, beautifully restored and maintained (and usually with good rest rooms). Stores everywhere with laughing girls, wanting to make you a dress or shoes in just a few hours and with the latest fashion Mags from which to choose a style. Restaurants lining the riverside and lines of stalls selling the classic bric-a-brac, or fresh fruit or mystery snacks cooked on-the-spot, looking like donuts and tasting like Asia. We started at the Japanese bridge, where a temple has been built in the middle. You can see the picture above this. There is a good map you can get when you pay the fee (modest) to visit the heritage sites and it guides you to the places worth visiting. You don't have to exhaust yourself on your first day. Each day you go to the Old Town, observe different things. There are the influences of ancient traders who have come to Hoi An which was one of the major trading ports at that time. You can find these in the houses of various clans which are still very well preserved. Some of these houses are open to the public. You can even taste traditional cooking in one of them. Some of these houses are like mini-museums. There are interesting pieces reminding us of the early traders who came and settled in Hoi An. 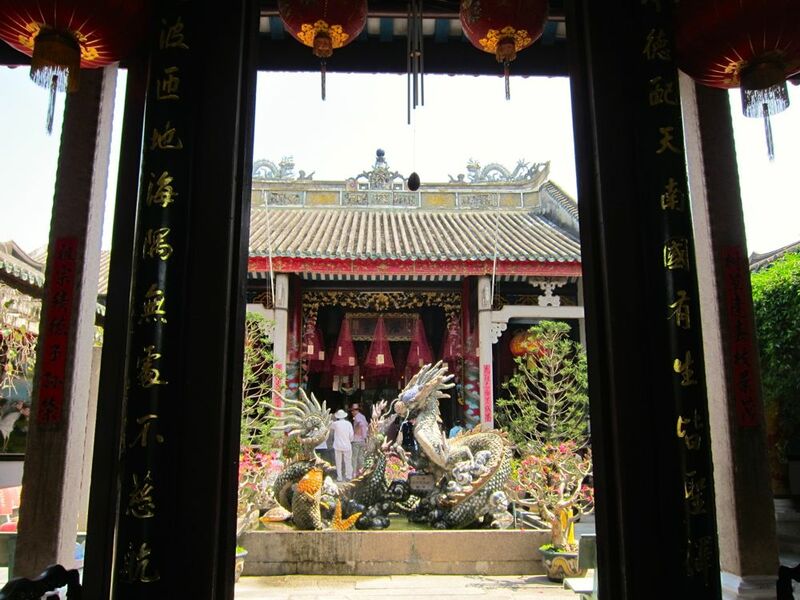 Also visit the Clan Temples and see for yourself the splendour and wealth these clans brought to Hoi An as traders. Hoi An was also the centre of the Champa civilization. 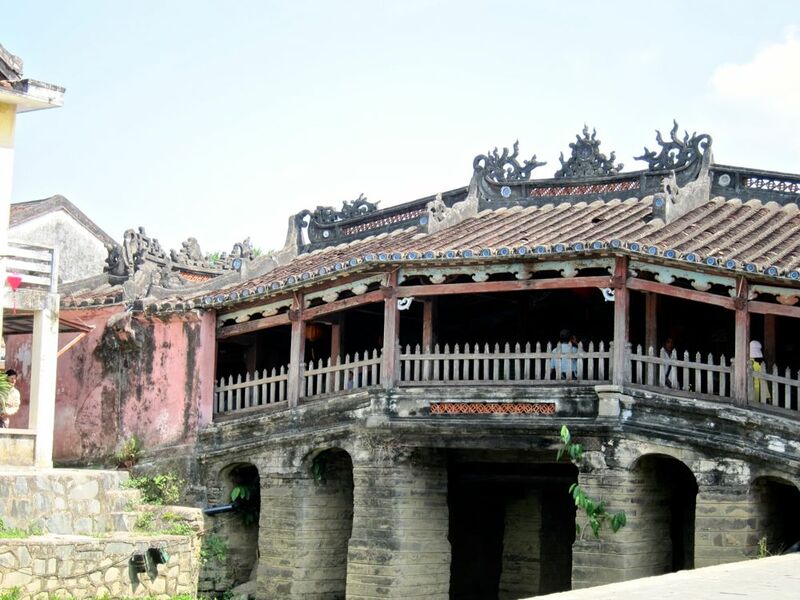 An easy drive from Hoi An is My Son where you can still see remains of the Champa civilization. When you go to Hoi An, it is not just Vietnam's cultural heritage that you'll enjoy but also Vietnam's beautiful beaches. 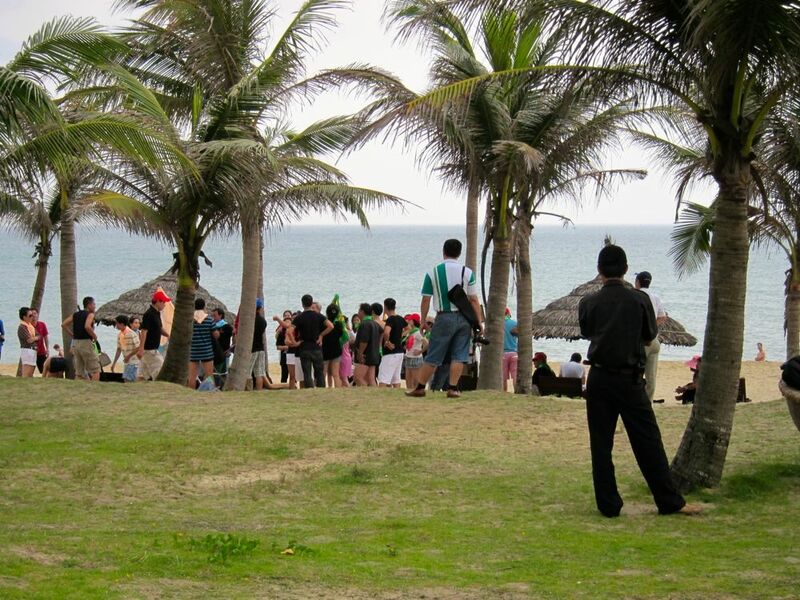 This is one of the attractions of Hoi An for us, a chance to enjoy the sun and a swim in the South China Sea. To enjoy this, stay in a beach side resort and drive to town or take a taxi. It is just a very short distance through beautiful rice fields and the taxis are easily accessible and quite inexpensive. We were lucky to meet Yum Yum...a truly Gilbert and Sullivan character. She has worked at the tiny Faifo restaurant right on the main street of Hoi An for perhaps 12 years....since she was a little girl. ​When she started, she spoke only Vietnamese, but she had a large tray called The Dollar Box, as everything in it was for a dollar. Each time people come in the restaurant, Yum Yum whipped up with her dollar box, the worlds brightest smile and a giggle/laugh that set everyone smiling with her. She manages the restaurant now and has built a team that makes you feel like a family in your own home. The laugh is still there as is the sense that she loves her life and is supremely self confident. Her little boy is often around after school and he shares the fun. And guess what...the dollar box is still there and out it comes when you've settled in. For a buck you celebrate a small part of the triumph of so many poor children who on their own and with a little luck, fought for and found a place in the world. We enjoyed talking with Yum Yum and after her careful and very experienced assessment of our little family team, became good friends. One morning, as we slumped exhausted into Faifo for a restorative post shopping beverage...Al Fresco...our new friend Yum Yum swooped over and invited us to a wedding for one of the girls who used to work in the restaurant. ​We jumped at the invitation knowing that this was the our best chance to dig deeper into Vietnamese culture as participants and not the classic tourist spectators. Well, we had so much fun. You can look at our pictures and just imagine what was going on. Indoor fireworks....4 year olds having chicken head fights....Karaoke by the tone deaf...and the warm feeling of a large room of friends enjoying each others company...amazing. After lunch, we excused ourselves and went for a walk in town thinking that the wedding party would stay on to celebrate further. But when we reached town, we saw that the Faifo was open again the indomitable Yum Yum was out of the wedding garb...hair do tied down, in uniform and with the greeters smile firmly fixed, waving in patrons. It is fun to shop in Hoi An not only because of the exotic things you see like the traditional Vietnamese lanterns but because they can custom tailor things for you so fast and they can convince you to buy things which never came to your mind when you entered this cultural site. We had clothes and shoes made and enjoyed the very experience of dealing with the shopkeepers. Our 11 year old grand daughter felt safe and happy staying with some of the shop staff and helping with English as we continued on our own in other shops. She felt safe going back and forth in stores on her own and really enjoyed her time. The smells and sounds of an old trading city are all around you but the shopping experience is very familiar. And remember the food market. It is a classic Mekong wet and dry affair serving local families...so you really step out of the tourist zone for a while. Many of the little stalls will cook the dishes right in front of you so enjoy trying out dishes you have never tried in your life. Safe? Well, we've never had a problem and the food really is fresh. If a little gastronomic adventurism frightens you, find a KFC! 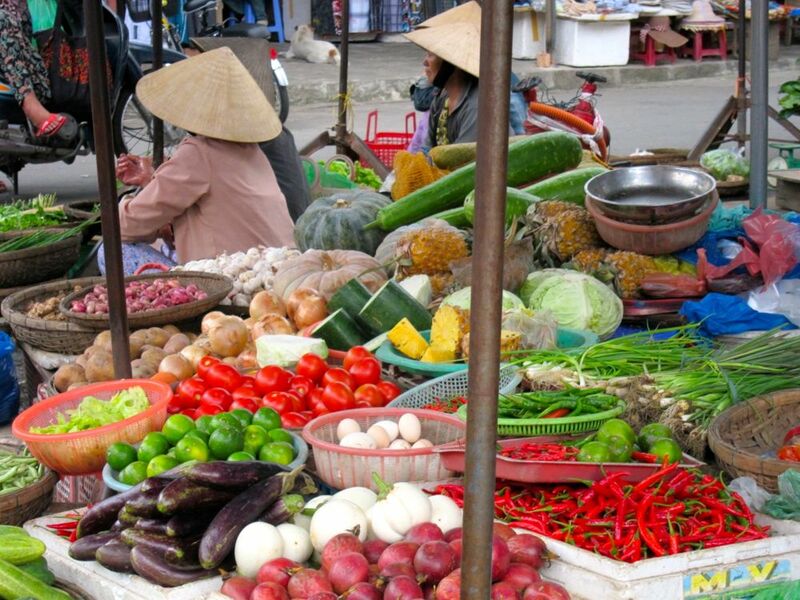 Once you have had your fill, go around the market and enjoy the different colours, fruits and vegetables, some you know and some you haven't seen before. Watch and take in everything. 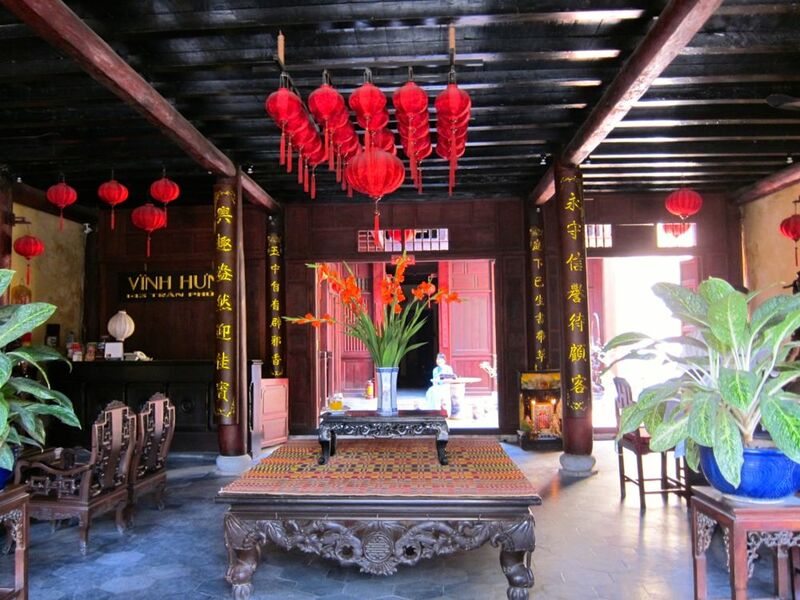 Now, tourists can watch Vietnam's traditional arts performed in Hoi An at a two-story old home. Visitors to Hoi An can enjoy traditional Vietnamese instruments played, folk songs or traditional southern drama called hat boi. Little is known about the Champa civilization so now in Vietnam, more energy is placed in rediscovering this interesting kingdom. It flourished around Hoi An and close to here is My Son which was the religious center of the Chams and worth a visit while in Hoi An. 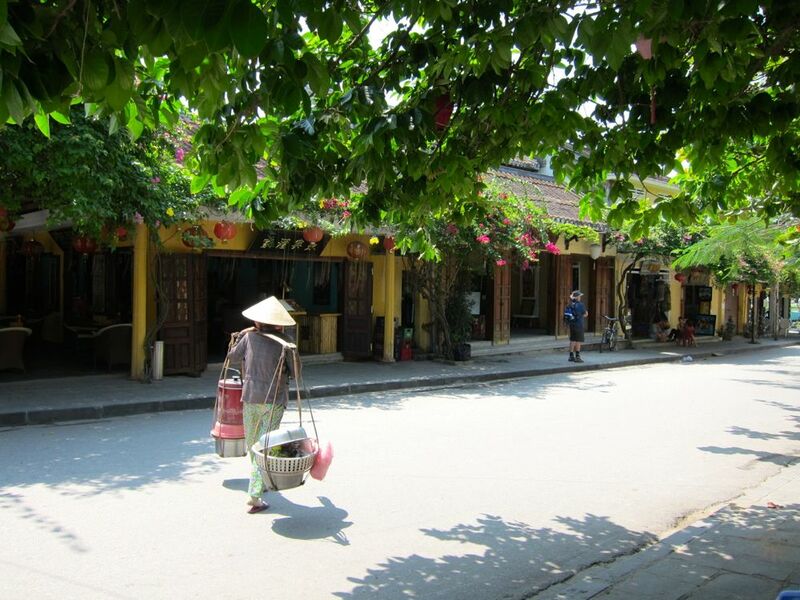 Hoi An offers many places of various types and budgets but mostly affordable. Your decision will be whether you want to stay in the beach or the city. As for us, some family members are on their mid winter holiday so we thought the beach would be just the right place. So, off I searched in the internet and found this well rated resort with its own beach and a swimming pool in each villa. Just what we looked forward to. Le Belhamy Resort and Spa was our home for our Hoi An holiday. With the owner personally managing it, our vacation just became one happy family get together. How did we get to know the owner? One evening, we walked around the property's huge grounds and someone approached us if we want to see the old chapel. We followed her but our son, wondering who this woman was, asked her what she does in the hotel and she unassumingly said, The Owner. The next morning, our daughter-in-law checked out the spa and she immediately came back to draw me to take the tour of the facilities. It was impressive and the spa manager knows what she is doing so we immediately booked ourselves to try it. What I like with this place is the attention they give the guests and the setting. One can walk in the beach forever or in the garden as the property is huge. You can cycle, too. Have you been to Hoi An? What was the best part of your trip?